Plywood is one of the building blocks of life. Group ply with studs of almost any size and you can build damn near anything. The shed out back, the house you live in and even the furniture in it can be constructed from ply and studs. It’s a powerful combo that isn’t fully appreciated until you’ve solved a few problems with it. From the most basic sheet ply and pine 2×4 or 2×6 combos to the extreme furniture-building applications that boast double veneered ply and solid hardwood trim, the basic composition is still the same. Span the gaps with ply and make the frame with studs. Take above images, for example. The military doesn’t have time or cash to build brick and mortar buildings for mobile or temporary posts. However you can have anything you want as long as it’s built from studs and ply. 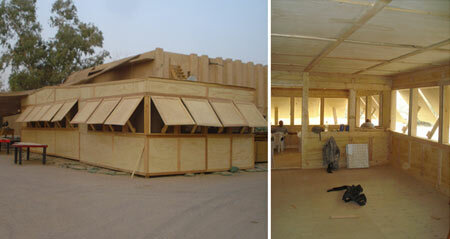 A 15’x30’ building with ventilation and sun blocks — no problem. It probably took the soldiers that built it a few days to put the whole thing together. Say you want a shed in the backyard. You could go buy a prebuilt unit, or you could just get some sheet goods and 2x4s and go to town. You’ll most likely spend around half the cash and wind up with a custom-built rig exactly to your own specs. Cheap, readily available, and easy to build with — if there’s a better trifecta, we’ve not found it. Note* Thanks to reader jeffrey.immer for the sweet photos. Great work, guys! I don’t want to imagine what the formaldehyde level is like being released from those plywoods. At least they have cross ventilation going on. why formaldehyde? I think your living in the stone ages. most plywood is F4 very little emissions. He made the trusses with 1×4’s – NOT 2×4’s. He had to build them to be strong enough. I don’t know what the comment about formaldehyde is about, but these guys are in a war zone. They probably smoke cigarettes and carry loaded weapons too. What!?!? They carry loaded weapons?! On a serious note, the DoD is actually looking at phasing out the availability of cigarettes and other tobacco to troops and their sale on base PX’s… and while I hate cigarettes and cigarette smoking too (my dad died of his 2 pack/day habit), I find this rather absurd too. wow…you can sign up to die for your country but you are not of legal age to drink and now you won’t be allowed to smoke f***ing cigs??? I don’t touch tobacco, but as far as I’m concerned if somebody wants to do so go ahead. Especially if you’re in the military…all that stress and what to calm the nerves? Tiddlywinks??? WTF??? tabacoo kills more more than going to Irag and Afganistan by a very large margin. When the military is paying for your health insurance they have every right to tell you what you can ingest or not ingest.Think of that the next time you vote for Obama Care. Nicotine does not calm you down either, it makes you nervous. Just what we need a bunch of trigger happy nervous soldiers. I thought of building a smaller version with floor-to-ceiling shutters on an acreage a while back. With screens in the windows it would be a well ventillated shack that could be easily secured when you’re gone; something for summer weekends. Thank you Jeffery for your service to our county and for protecting our Freedom!!! Keep up the good work and I hope you have a safe return. but if you add the intense heat of around 120 degree or greater daily and the make up of the dust in other pics i have on my flickr site, then you would probably not be too worried about the plywood. as far as loaded weapons, on the FOB our weapons are not loaded, but i have nothing but respect for the guys who have to don their helmets and vest and lock and load daily, those guys have a hard job. i get to to build stuff daily, and enjoy myself doing it, it can be grueling work with just two of us to produce 90% of all the work (occasionally we get soldiers to move large quanities of stuff) but it has it’s own pay offs right?